:What do we do with a God who calls Himself ?jealous,? who allows suffering in the world, and who promises in His Word to judge everyone on earth? How does that reconcile with the image of God popular in evangelical churches ? loving, forgiving, and shepherding us? More importantly, how does a person going through hard times learn to embrace a God who can allow such difficult circumstances? Longtime pastor and director of Open Doors Kurt Bruner explores who God is, how He works in our lives, and how we can see Him at work. 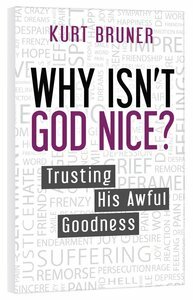 About "Why Isn't God Nice?" Kurt Bruner is pastor of Spiritual Formation at Lake Pointe Church near Dallas, a graduate of Talbot Seminary and author of books with combined sales of over 500,000 copies, including The Divine Drama, the recent best-seller Finding God in The Lord of the Rings; Inklings of God and Shedding Light on Dark Materials a critique of the writings of Philip Pullmann.